I did not plan to make most of the items listed below. The Lord provided the time to do them and an abundance of materials through donations from strangers, from thrift shop bargains, and from long forgotten items in my own closet, so I used those supplies to knit and to sew. 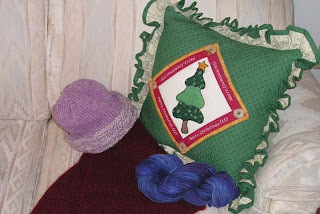 Most items were made for charities and a few for gifts and personal use. Charity items are indicated by a *. While I did not keep track of the amount of yarn that I used for these projects, it would be interesting to calculate. I am in awe of the generosity of those who donated the yarn. It is not uncommon for me to come home and find one or two bags of yarn on my doorstep. I have no idea who leaves most of the bags. I feel knitting items for charity is something the Lord wants me to do. I am humbled by this call. Yes, this is Wednesday and not Monday, but life got in the way of the Monday post. Outside My Window. . . the wind has finally stopped howling, and the sky is the color of Paul Newman's eyes. 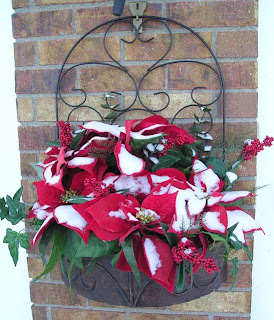 The Christmas displays in my neighborhood are disappearing with each passing day. The electric candles will continue to glow in my front windows until Epiphany. I am thinking. . . about 2008 and the many blessings I enjoyed: the successful start of the Wyoming Pulmonary Hypertension Support Group and newsletter, a scholarship to attend the PHA International Conference in June, relatively good health and being able to eliminate the use of supplemental oxygen, meeting online friends in person, and exceeding my charity knitting expectations. I am thankful... for the year behind me and and the new one that will begin tonight. In the kitchen... is a pot of simmering soup: white chili made with great northern beans, carrots, celery, and leftover Christmas turkey. I'll bake some cornbread this evening to accompany the soup. I am creating... some short-cuff socks using scrap yarn. I've am working on the fifth pair now, some pink ones for my sister. She hosts a Breast Cancer Awareness walk each year, and the socks will be perfect for her to wear. I am planning... the programs and projects for the Wyoming PH Support Group. My co-leader and I met Monday afternoon and came up with some ideas. Now, I need to see if they are possible. I am reading... Vinegar Hill by A. Manette Ansay is still on my nightstand, but I haven't read any in it for a couple of weeks. 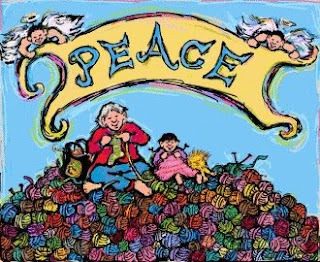 I am praying... as the new year approaches for Peace on Earth. I am disappointed that throughout the world, people are so cruel to one another and have been for thousands of years. I pray that mankind (every person in every country) can learn to get along and work toward a common good. Yes, I am an idealist, but the status quo is not working. I am hearing... the steady ticking of my clock, the hum of the refrigerator, the soft click of the baseboard heater, the tapping of computer keys, and the creaking and popping of the house. One of my favorite things... a cookbook of family recipes that my niece complied for a reunion in 2006. She asked every family to submit recipes which she organized in a small three-ring binder. A Few Plans For The Rest Of The Week: a hair cut this afternoon, communion service tonight, a day filled with movies tomorrow (I do not like football), and more knitting. ~If you'd like to participate in The Simple Woman's Daybook (each Monday), you can visit The Simple Woman's blog here. To get instructions for participating, click on The Simple Woman's Daybook icon in her sidebar. I make a lot of socks. They are portable and work up fairly quickly. Because of this passion, scrap sock yarn has been multiplying in one of my storage baskets, and it was time to take action. I sorted through the odd-sized balls and tried to find coordinating colors and then weighed them trying to find adequate amounts for some short-cuff socks. So far, I have completed three pair (the blue ones at the bottom of the photo are now complete) and have another pair started, using the yarn on the right. Who will wear these socks? I don't have a clue, but at least the yarn has been put to use. 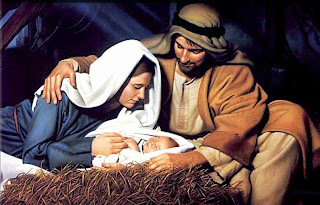 has been born to you; he is Christ the Lord." My mother loved Christmas and always made it special with all kinds of sweets, treats, and treasures - most homemade. My parents' room was strictly off limits from October through Christmas. During my childhood all of ourChristmas trees were real. The high school FFA (Future Farmers of America) sold trees at the school, at the local fire house, or at the local grocery store. Many of the trees were pathetic, and my brother would drill holes in the trunk where there were bare spots and attach some bottom branches to improve the appearance. We had "Charlie Brown" trees before the term was even penned by Charles Schultz. My mother hung tinsel on the tree, one icicle at a time. Some years the tree was literally covered with tinsel, applied one bit at a time. The tree sparkled all day in the sunlight and at night from the colorful lights. We always opened gifts on Christmas morning, but not early like most families. My excitement was hard to contain, but contain it I must because living on a dairy farm meant that the cows had priority. The tempting packages under the tree had to wait until the milking was done, the barn cleaned, and the cows fed. The morning seemed to never end. Santa knew that I would get anxious, so he left a toy, usually a doll, unwrapped to occupy me. Of all the dolls I received from the jolly elf, the one in the photo was a favorite. I still have the doll and several dresses that Mom made for her. 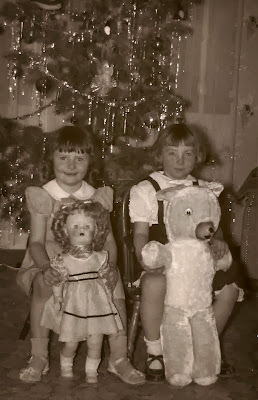 My friend Cathy (in the photo with the bear) lived about a mile away. Sometimes a smell, a sound, or a situation causes a flicker of a past Christmas. The moments are fleeting, but if I am quick, I can recapture some of the special magic of Christmas Past. The West Coast Oddball Knitting group has completed 10 blankets since July, and other blankets are near completion. You can see all of the blankets on the group blog. I started a blanket on my own in July, but Christmas knitting soon took priority. The blanket was stuffed into a bag and nearly forgotten. 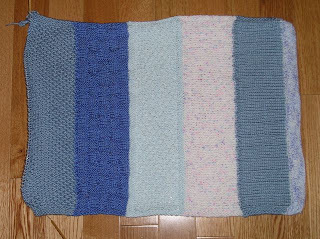 In my quest to finish projects before the end of 2008, I discovered the blanket. This week, I have worked on it every evening, and tonight, I finished it. In true Oddball style, I changed the stitch pattern every four inches. 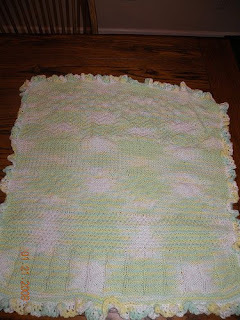 I hope that the coordinator can find someone who will crochet a border on the blanket so it can be added to the other completed blankets. The blanket needs a name. Any ideas? 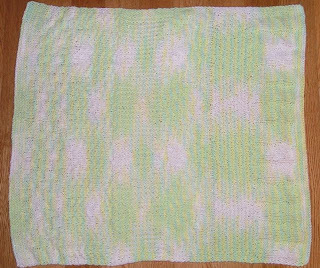 Update: Thanks to the suggestions, this blanket is being named Lime Sherbet. 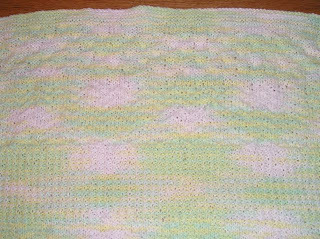 Lime Sherbet has a border and is now officially complete. Thank you Mary for adding the border. This may become your favorite fruitcake recipe. Check the whiskey again to be sure it is of the highest quality. Pour one level cup and drink. Repeat. Turn on the electric mixer; beat 1 c. butter in a large, fluffy bowl. Next, sift 2 c. salt. Or something. Who cares? Now sift the lemon juice and strain the nuts. Throw the bowl out of the window. Check the whiskey again. This "Fruitcake Recipe" has been circulating the Internet for many years. I discovered it when I was searching my recipe collection this morning. I do have a legitimate recipe for a delicious fruitcake. I remember helping my mother make it a couple of times. It takes nearly all day to make because it has some intense preparation (chopping sticky, candied fruit, measuring the copious ingredients, etc.) It is very expensive to make, but it is soooo good. The last four years, my sister would send me two loaves with her Christmas packages. I would freeze them to keep them fresh and nibble on them for the next two months. She didn't make the fruitcakes this year, and I miss them. 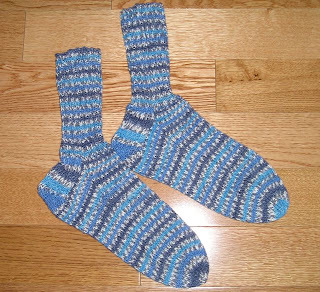 I have no idea how long these socks have been on my needles, but I am relieved they are finally finished. The yarn is Sockotta (45% Cotton, 40% Superwash Wool, 15% Nylon) by Plymouth Yarn. I am a little disappointed that the feet of the socks do not match, but except for the toe, they are pretty close. This pair is a gift for one of the workers at the hospital. Whenever he sees me knitting on my volunteer shift, he wants to know when I am going to make him a pair of socks. I hope he will get a lot of use out of them. The yarn is a perfect weight for those who do not like a thick sock or for those who live in a warmer climate. I like to wear the ones that I have in the summer: the cotton makes them cooler, and the wool wicks the moisture away from my feet. 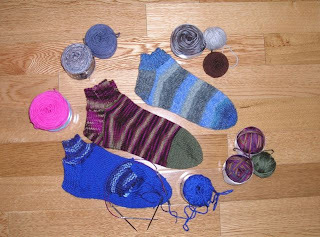 Now, I have only a couple of extended-projects on the needles (my monster socks and a baby afghan). I hope to finish both projects by the end of the year, so I can start 2009 with a new slate of projects. My knitting group met last night, and I took some small gifts that I had prepared for everyone. I made some stitch markers and attached them to a small card. 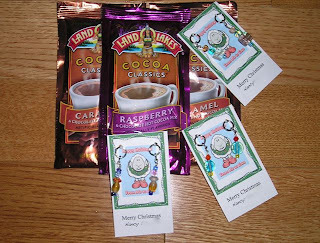 Then I attached the card to a packet of Land o Lakes cocoa. The gifts were placed in a small basket, and everyone selected their favorite cocoa flavor and the stitch markers that they liked. Those who did not attend last night will select from the three remaining treats. The holiday card was printed on business card stock which was just the right size to attach the stitch markers. A birthday version of the card is also available. Outside My Window. . . the sky is gray, and the air is cold. It is 3 degrees, but the wind chill is -15 degrees. This morning, it was -10 (wind chill was -30) when I left for my volunteer shift. I would have preferred staying home. I am thinking. . . that Hawaii sounds pretty good right now. Hmmm, is it too late to book a Christmas flight? I am thankful... for the heated seats in my car. Nothing like a warm tush on a cold, cold day. In the kitchen... are grocery bags that need to be unpacked and the items stored in the pantry. I seem to purchase more groceries in the winter. I am wearing... sweat pants and a turtle neck. I am creating... a pair of self-striping socks, a garter stitch block for a lapghan, and another hat. I am planning... to make some treats for my neighbors. I usually make a tray of cookies or other treats as a holiday gift. I am reading... Vinegar Hill by A. Manette Ansay. The book is interesting and well written; however, I only read in short bursts on Sunday afternoons. I am praying... for strength to resist temptations to overeat. I am gaining too much weight. I love food, and it is especially hard because my choices are not always healthy. I am hearing... the roar of a portable space heater. The cement floor of my neighbor's new garage was recently poured. Now, the structure is covered in plastic, and the heater is helping dry the cement and keeping it from cracking from the cold. One of my favorite things... the electric candles, in all of my windows. 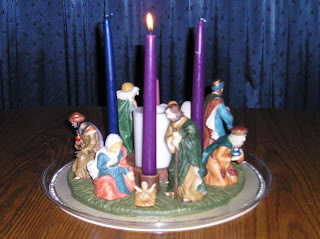 During the month of December and until Epiphany, the candles are illuminated. After my neighbors' holiday lights have been extinguished, the candles in my windows burn on. They are on 24 hours a day, welcoming all who seek shelter or desire hope in a dark world. A Few Plans For The Rest Of The Week: attend a holiday party tomorrow afternoon and, hopefully, finish writing Christmas cards. 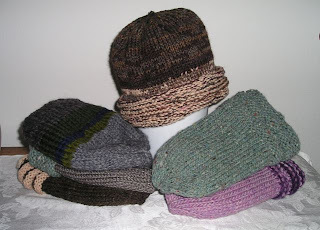 Seven hats in seven days, all from scrap and oddball wool. These hats will be given to a local charity. Since the high temperature today was only 4 degrees, I am sure they will be appreciated. Outside My Window. . . is a gloomy day. The sun is trying to shine through the clouds, but a storm is looming. I know the wind is blowing, as the smaller tree branches are swaying. I admire trees; they are perfect role models. Their core is strong and hardly moves when the world around them is in turmoil. My goal is to be more like a tree with my faith as the core. Though I may be assaulted with troubles and worries, I strive to withstand the brunt of the storm with my core to keep me steady. Yes, I want to be like a tree. I am thinking. . . that I can not control the actions and behavior of those around me. I can only control my own actions and thoughts. I am thankful... for the opportunity to stay home today. Normally, I volunteer on Monday mornings, but another lady wanted the shift today. I am content to stay home and be lazy. In the kitchen... my breakfast awaits: oatmeal heating in the microwave. I am wearing... my pajamas and robe. I am enjoying my idleness this morning. I am creating... a cowl from scrap sock yarn, a baby blanket, cowls, and stitch markers. I am planning... to knit up as much of my scrap yarn stash as I can before the end of the year. I managed to make a dent this week, and with any luck, I may reach my goal. I am reading... Vinegar Hill by A. Manette Ansay. It is such a sad book: the character's life is so out of control, yet she can do nothing about her circumstances, at least so far. I am praying... for my neighbors. He has lung cancer and is taking daily radiation treatments for which he must travel four hours round trip. I am hearing... the rumble of construction equipment down the street where a neighbor is building a garage. One of my favorite things... a small, silver locket that my brother gave me about forty years ago. A Few Plans For The Rest Of The Week: attend a dinner party with my knitting group and write some Christmas cards. Have patience with little ones. Help them contribute to the world around them. 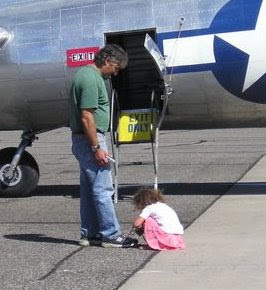 This photo was taken about two years ago at the B-17 bomber exhibit. It was the last photo I took that day, and I felt fortunate to catch the scene between this man and the little girl. She was so intent on tying his shoe. I am sure his laces were a mass of knots when she finished, but she felt good about what she was doing because she was "helping." Just Keep Knitting, Knitting. . . Remember the movie "Finding Nemo"? When the search seemed impossible, Dory gave the sound advice of "just keep swimming, swimming, swimming" It also works when the yarn is piled all over the house and something must be done with it before the department of health intervenes. I made three cowls out of the blue yarn and another one out of some handspun pink/blue and started another one, using scrap sock yarn. The finished cowls are blocked and ready for gifting. Even though I liked the curled edge, they do look better blocked. Thank you for the suggestions. Then an Oddball Baby Blanket arrived in the mail. I worked on Little Boy Blue earlier, but the group needed a pinch knitter, so I volunteered. I rarely see the blankets with so many knitted sections, and it was a treat to see the progression of this blanket. Little Boy Blue is finished. The yarn featured in the December Pillow Talk provided two cowls (the pattern calls them gaiters), and I have enough left over for a shorter version. It is on the needles and should be finished today unless something comes up and I can't knit. I haven't decided if I want to block the cowls or not. I like the "curl" at the top and bottom, but the recipients may prefer to have a straight edge. I will have to ponder that for a while. Any suggestions? The cowl pattern is in Creative Knitting, November 2008. 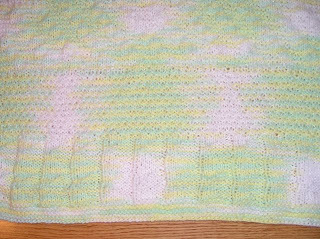 The stitch is called chevron lace and is an easy lace pattern. I am so excited to share this information. Those of you praying for Mason, the young man with pulmonary hypertension, will be pleased to hear this news, too. I'm finally back home. What a experince it was. A brief review of it what happened while I was there was, respiratory failure, kidney failure, internal bleeding, c-diff. I spent 10 days on the vent and about 15 in icu. I think about 21 or 22 days altogether. I have never been so weak after waking up from the vent. I couldn't even move myself in bed about a 10 days ago and now can stand on my own and walk a few feet. A lot of work to go but making progress. Thank you all for your support. I will post more when I'm a little more alert. I still get dizzy and tired fast." Thank you for your prayers and keep praying for Mason's recovery. Stash buster #3 is off of the needles. Adult earflap hat, made with bulky wool yarn. I even used my newly acquired and very limited crochet skills to do the edging and ties. 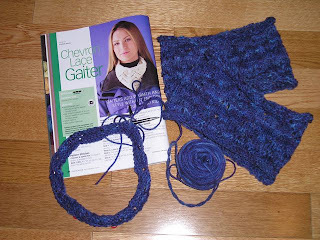 Next on the needles will be the Chevron Lace Gaiter/Cowl. Dramatic, yes, but that's my story. 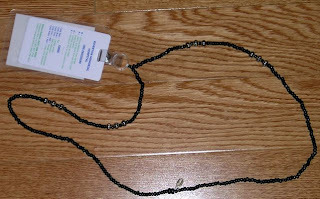 Once I had the beads picked up, I set out to salvage the lanyard by restringing the beads. 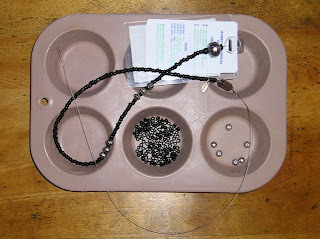 The beads were originally strung on wire and the wire came undone on only one side. I got the beads on the wire but could not figure out a way to secure it to guarantee that it would not come undone again. I used dental floss for the repair, and I think it is going to work great. Order has been restored and all is right with the world. ** Only my dignity was harmed in the repair of this lanyard. A main goal this month is to use some yarn from my stash. This week, I finished the cranberry shawl from some "mystery" yarn that I purchased at a yard sale. It feels like wool, and I think it has some mohair in it. The shawl is for February's All Crafts for Charity project. The shawl is a simple triangle garter stitch wrap. 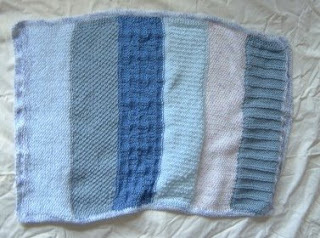 I will use scraps yarn to make some 12 inch squares for the same project. The lavender hat is made from some wool that I got through Freecycle. A woman gave me three skeins for the wool, some needles. 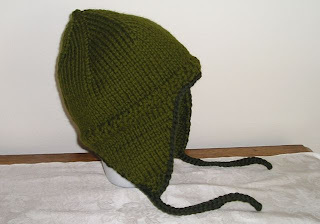 I used a double strand of wool for the brim to keep my ears warm on cold, winter days. She also gave me two balls of purchased wool that is labeled as unscoured wool, a new term to me. I did some research and discovered very little information, but what I did find makes me wonder if I should knit with it. However, I did find some lovely hats on this site made with unscoured wool. Has anyone had experience knitting with unscoured wool? The hank of yarn on the right is wool, silk, and angora. It is destined to become cowls for Christmas gifts if I can get them made in time. These completed projects have only put a slight dent in my yarn stash. To do any major damage, I need to doggedly focus on knitting. Outside My Window. . . the world is dark except for my neighbor's outside light offering a glow of comfort. I am thinking. . . about putting up a few decorations for Christmas. I don't have the desire to decorate a tree so maybe I'll bring out a few pieces of Christmas cheer. I am thankful... for all the blessings the Lord has given me even though I do not deserve them. In the kitchen... the tea pot is sizzling and releasing a stream of circling steam. It's time to prepare a cup. I am creating... some stitch markers for the ladies in my knitting group. It is fun to select the beads to match each person's taste, but I find twisting the wire to secure them difficult. I must be doing something wrong. I am planning... the December newsletter for my support group. I am reading... Vinegar Hill by A. Manette Ansay. The book seems so familiar to me like I have read it before, but I don't think I have. I wonder if I read an excerpt somewhere. 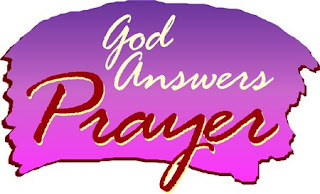 I am praying... that my sister and her husband have a safe journey home from Arizona. I am hearing... the ticking of the clock over my right shoulder. I love my two regulator clocks. One is an antique that I purchased in Japan 20 years ago. One of my favorite things... the porcelain wreath that sits in the center of my kitchen table during the season of Advent. A Few Plans For The Rest Of The Week: a) haircut and b) lunch with two old friends. while waiting is harder still..